Shutdown Threatens To Stall Recovery In Wildfire-Ravaged Paradise, Calif. A federal grant for basic infrastructure projects is stalled. There is concern that, if fire survivors don't see evidence that recovery has begun, they could give up hope and leave the region. 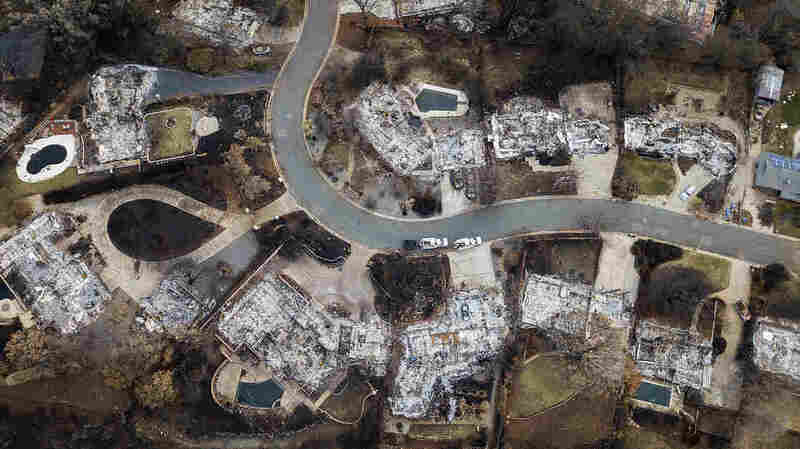 Shutdown Threatens To Stall Recovery In Wildfire-Ravaged Paradise, Calif.
Homes leveled by the Camp Fire line Valley Ridge Drive in Paradise, Calif. Some recovery efforts are stalled by the government shutdown, creating anxiety among survivors and concern for officials. The historic government shutdown is beginning to stir anxiety in and around Paradise, Calif. The town of about 25,000 people was almost completely destroyed by a deadly wildfire last November and almost everyone and everything directly affected is relying heavily on federal aid. So far FEMA and Small Business Administration loans do not appear to be affected. But local officials say the shutdown is causing delays in more under-the-radar infrastructure projects, which could have serious, longterm consequences. "Time is of the essence, we want to try and move this along as much as we can," says Marc Nemanic, associate director of the local non-profit 3CORE which is aiding Paradise in recovery planning. A prolonged stall is Nemanic's biggest concern. You'll start having a brain drain and money leaving the community and making us actually in a worse position than we were before the fire. His organization has been waiting for more than three weeks now to apply for up to $750,000 in disaster grants from the Economic Development Administration, a bureau within the U.S. Department of Commerce. Like other federal agencies, the Department of Commerce is largely closed because of the shutdown. 3CORE is partly funded by the Commerce Department, and partners closely with it to further economic development projects in rural northern California. The latest grant proposal would help Paradise begin planning for its daunting recovery: "Roads, sewer, water, those essential girders that you're trying to build," Nemanic says. He adds Paradise can't afford any delay or uncertainty. Many people here living in limbo — in hotels, shelters, couch surfing — need to see signs of something happening, some kind of progress. Otherwise they'll leave. "You'll start having a brain drain and money leaving the community and making us actually in a worse position than we were before the fire," Nemanic says. Ironically, wildfire prevention work itself has also ground to a halt on federal public lands in Butte County, and elsewhere. The rainy California winter is a key window for prescribed fire and other mitigation work in the Sierra foothills. At this time of year, federal land agencies are now usually well underway with that work. If the work does not happen this season, that equates to another year of increased vulnerability to fire risk. "Projects they were working on have been on hold since the shutdown," says Prof. Don Hankins, a wildfire expert at Chico State University. Federal agency representatives have been absent from local fire planning meetings, which causes headaches and stalls work because a lot of the projects are on a mix of state, private and federal land. "If the work does not happen this season, that equates to another year of increased vulnerability to fire risk," Hankins says. In the hamlet of Forest Ranch, on a finger-like ridge just adjacent to where Paradise nearly burned to the ground, Stephen Graydon and his contractors are almost done with a 300-acre prescribed fire and fuels break project. Graydon, who runs a non-profit called Terra Fuego, says there are just eight piles of slash left to be burned. But they can't get the go ahead from the Bureau of Land Management to finish the job because the agency can't send a staffer out to approve it. The area was mostly spared from last November's Camp Fire. "We're trying to get it prepped to where this is a good strategic area and a defensible space," Graydon says. "Right now the more we wait, the more risk we have to take on when we do this sort of thing later in the year." Contracts like Graydon's are stalled. But so are talks about any future projects on federal land that were already funded and ready to get done before the next fire season. For fire managers, this is a source of particular anxiety given that hundreds of thousands of acres of fire prone national forests in northern California are in dire need of some sort of fuels treatment. "We're creating a negative feedback loop where we're consistently going to get further and further behind," Graydon says.